North East Line (NEL) is the third Mass Rapid Transit (MRT) line. Traveling from one end to the other takes about 35 minutes. The line is currently 19.2 km long with 16 stations and it is fully underground and automated. It is the first line to have artwork integrated into all its 16 stations under the Art in Transit programme. 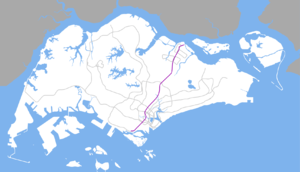 On 17 January 2013, a 2-kilometre extension which will run from Punggol through Punggol North including the new Punggol Downtown was announced. It is expected to be completed by 2023. The rolling stock consists of Alstom Metropolis C751A and Alstom Metropolis C751C trains. These trains operate from Sengkang Depot near Buangkok station. ↑ "TWO NEW RAIL LINES AND THREE NEW EXTENSIONS TO EXPAND RAIL NETWORK BY 2030". Land Transport Authority. Retrieved 17 January 2013.